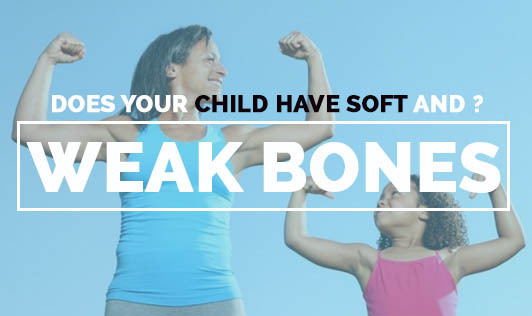 Does your child have soft and weak bones? Rickets is a bone disease that affects infants and young children. It is the softening and weakening of bones in children often because of an extreme vitamin D deficiency. Vitamin D promotes phosphorus and calcium absorption from the gastrointestinal tract that is essential for maintaining healthy bones. A child's body needs vitamin D to absorb calcium and phosphorus from food. Sometimes, children may be born with or develop medical conditions that can affect the way their bodies absorb vitamin D such as having kidney problems, celiac disease, inflammatory bowel disease and cystic fibrosis. • A sensible balance of exposure and protection from the sun can protect one against vitamin D deficiency without putting your child at risk of skin cancer. • A diet including foods rich in vitamin D and calcium. Contact your doctor if your child develops muscle weakness, bone pain or skeletal deformities!